My aunt, who grew up in the original Fountain Avenue kitchen, shared this simple recipe with me years ago, and it has been a favorite in our house ever since. 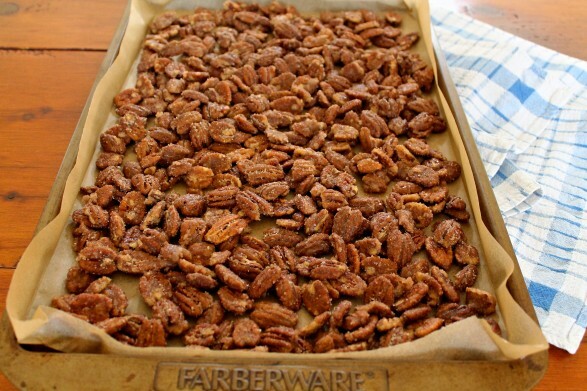 These pecans are so easy to prepare and hard to resist. The incorporation of an egg white creates a crispy, crunchy, sugar coating while the cinnamon adds just the right amount of spice. A handful of these satisfy pre-dinner munchies, and a small bowl set out for company is sure to delight. 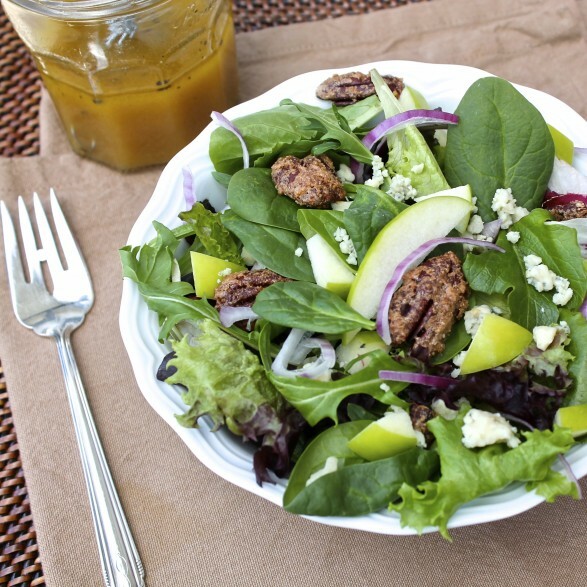 Added to one of my favorite salads–Apple Pecan Spring Greens with Maple-Dijon Vinaigrette–these pecans create a flavor-marriage made in heaven and supply the hint of crunch every good salad needs! Preheat the oven to 300 degrees F, and grease a rimmed baking sheet or line it with parchment. In a large bowl, whisk egg white with water until frothy. (I do this with a fork or small whisk.) Add pecans and gently toss to coat. In a small bowl, combine the sugar, cinnamon, and salt. 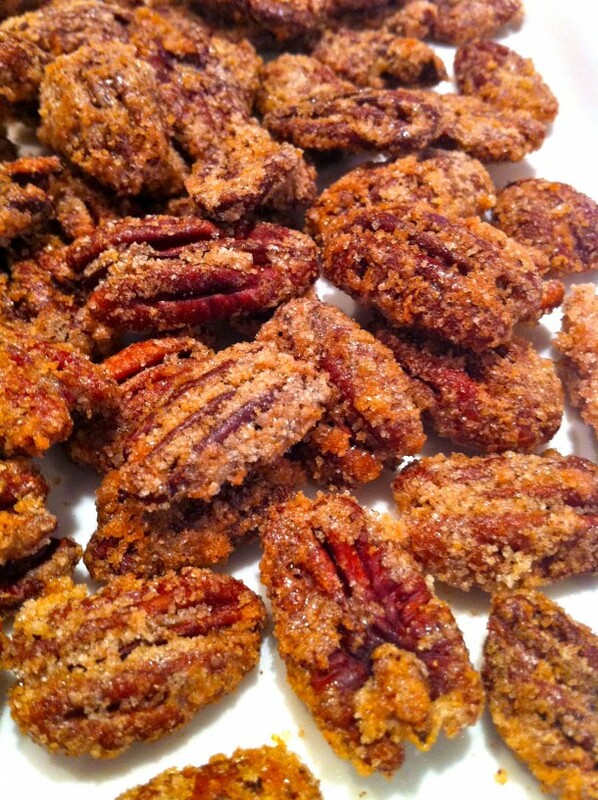 Pour over pecans and mix thoroughly. Transfer the nuts to the prepared baking sheet and bake for 45 minutes (see notes below), stirring every 15 minutes. When done, spread on another baking sheet and cool thoroughly. Store in an air-tight container. The pecans will stay fresh on counter for several days. I like to store them in the refrigerator where they will stay fresh for quite a while…not that they will last too long! For years, I made this recipe with the oven set to 300 degrees F. More recently, I have cooked them at 275 degrees. The nuts turn out just as well but the chance of them over-browning if you miss the timer by a few minutes (which I have done once or twice!) is greatly reduced. This tends to be more helpful when using a dark-coated pan or if your oven tends to cook on the hot side. 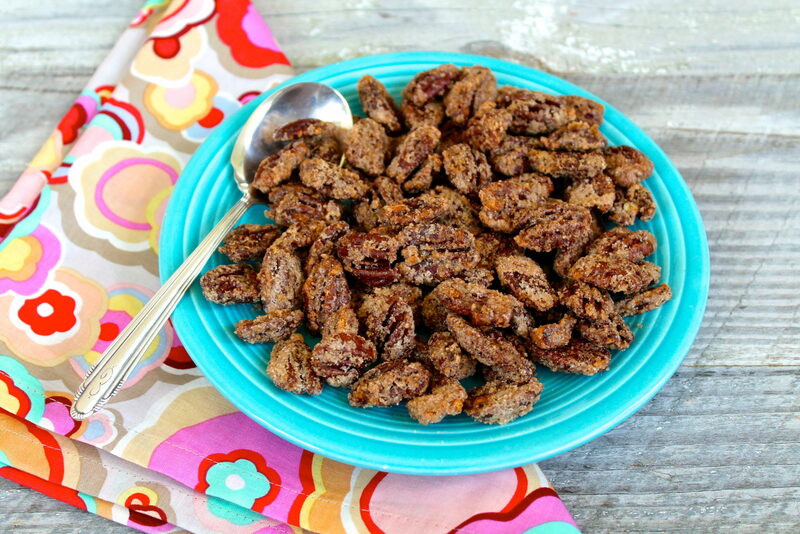 A favorite way to use these pecans…salad recipe linked above. oh my! this looks amazing.. must try making these soon. My family loves these…I just keep making them over and over. LOL They are great to make ahead of time and store in the freezer until needed. They will still come out crunchy. Thanks for an awesome recipe. I am so glad you love them as much as we do, Martha! Have you tried them in the Apple Pecan Spring Greens Salad? We love them all by themselves, but that salad is my favorite way to include them in something. Thank you for the great comment! These look delicious, and I plan on making these for Christmas Gifts….. thank you for sharing ! Thank you for letting me know, Jools! I am sure they will be well received! I just made these yesterday — and have discovered that if I want to have any left for gifting I need to hide them. Because it was what I had on hand, one batch was made with mixed nuts, pecans, almonds and cashews. I love how you used a mix of nuts, Starling, and I know what you mean about hiding them! They are hard to resist! Thank you for the comment and happy holidays to you, too! I hope you love them, Terra! I have even mixed in cashews and they taste delicious, too! My advice to folks wanting to try this: double the recipe, they won’t last long! Yum! You were reading my mind, Ann. I need to make these quick for tomorrow and you posted it just in time. These alone make me eat a salad!!! Merry Christmas! Thank you, Jeanne, and I’m glad for the good timing! Merry Christmas to you, too! Made these last evening and put them in one cup mason jars to give as gifts. Had to force myself to stop eating them, though, or I wouldn’t have had enough to fill my jars! I used one teaspoon of the “fine” ground sea salt, and it was just right. I also used the parchment paper. What a great invention! No clean up at all. I am looking forward to making more of your recipes. I eat far too many when I make these, too. I’m so glad you’re happy with them–and enjoyed the light cleanup!